The confederate Gulch is a great place to prospect for gold in Montana. Gold was first discovered at the gulch by former confederate soldiers in 1864. When the Civil War ended the government issued an amnesty to all former confederate soldiers in Arkansas if they went west by the Missouri River. Some of these soldiers heard of gold discoveries in Montana and decided to try their luck there. They discovered placer gold in a gulch located near the big Belt Mountains. This later became known as the Confederate Gulch. Located on the east of the Missouri River between Townsend and Helena, Confederate Gulch is about 90 miles northeast of the Alder Gulch, another rich mining area in Montana. This gulch contained some of the wealthiest placer gold in Montana. A surge in the arrival of miners took place after news spread of the discovery of gold late in 1864, swelling the number of inhabitants in Confederate Gulch to over 10,000 during its peak. During that time, miners worked placer claims on the upper stretch of Confederate Gulch and its tributaries, particularly Cement Gulch, Boulder Creek and Montana Gulch. The Diamond City gave supplies and entertainment to miners and served as the primary seat of Meagher County. Confederate Gulch area produced gold by both dredging and lode mining into the late 1940s. The rocks beneath the Confederate Gulch area are sedimentary, made up of shales of the Greyson and Spokane formations, and also limestone of the Newland development. These are divided by diorite and quartz diorite barriers, stocks, and ledges. The wealthiest placer gold ground, near the gulch, was found at Montana Bar at the foot of Gold Hill. There were about two acres of land produced more gold per acre of land than some other placer claim in Montana. 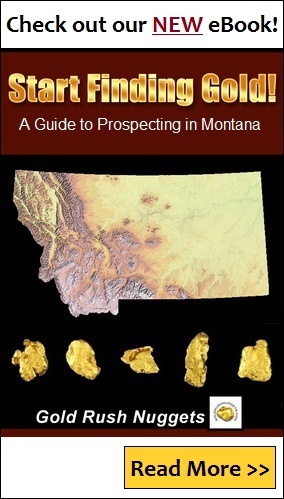 The highest was one pan that reported to contain gold worth a high of $1,400 in gold, and it was not uncommon to wash out $1000 from a gold pan loaded with Montana Bar rock. Water was basic to the hydraulic mining operations in Confederate Gulch. Crews constructed a trench on the north side of Confederate Gulch in 1866 to send water to sluicing on Montana Bar, about the same time that the Boulder Ditch Company burrowed four and a half miles of trench to convey water to higher claim areas. A few years after the discovery, King and Gillette of Helena built a half mile of bedrock flume in the same territory. Hydraulic mining invaded the area and occupied water in Confederate Gulch to the point where it undermined the structures in the Diamond City. Townspeople moved the structures and the city kept on growing in the late 1860s. As the gold deposit begun to diminish, the populace dwindled during the following decade until around 60 inhabitants remained in 1880. Sporadic hydraulic operations continued in Confederate Gulch and its tributaries for a long time until the 1920s when they became unsustainable. Dredging operations then moved into the territory in the 1930s, using power scoops and an assortment of other gear, including a stationary washing plant, dryland dredge, and dragline dredge. This continued until late 1940s when the mining stopped. Today the confederate Gulch is an important historical mining area. Unlike most early gold deposits, there is no ghost town around the area, but you can reach the gulch through passable roads.